When making the exploding box I discovered something new - atleast to me while welding. The order in which you group or weld is important. A note on welding in gypsy - you do not necessarily need to group to weld. You just select click the weld button and then select the next shape.When you do not want to weld another shape just click on the weld button (it'll not be yellow anymore) and then add the shape. But grouping makes it so easy :) and we gypsy users are spoilt. So coming back to the topic. It's better that you try with me here. Trial files 1 & 2 are in my blog under Test files. Download both and open to see what I am talking about and then create a new file to try it out. 1.Set a cursor size to 3 and select a square from gypsy wanderings. 3.Ungroup everything to start over fresh. 4. 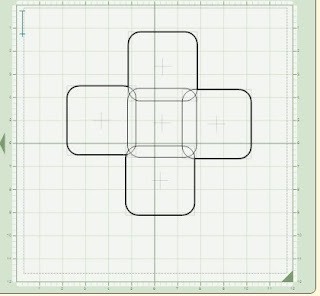 Make the 1st square center square. 5. 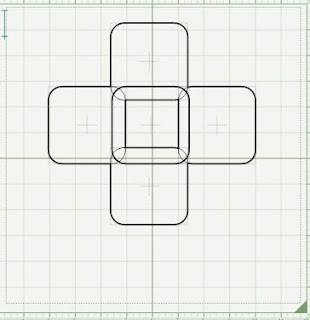 Next move the rest of the 4 squares on each side and overlap. Thank you for all your videos. I consider you one of the Gypsy Chics. LOL I left some love for you on my blog and an award. Stop by and pick it up. Ok, you are awesome... I couldn't figure out why some things weren't welding right, when they should. This must be it! It works! It really works because I tried it! Thanks! I forgot to sign my name to my last comment so please it! Mercy! The one that I said it works because I tried it!